That poor Simon Jenkins. Not a day can go past without someone questioning the choices in his book England's Thousand Best Churches. 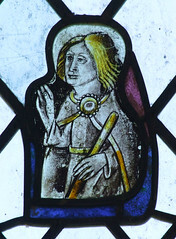 Here in Suffolk, he missed three that are clearly county top twenty material: the amazing St Andrew at Westhall, grand St Mary at Redgrave, and here, St Margaret at Sotterley. Westhall has been described as Suffolk's best-kept secret, but in many ways Sotterley is more secretive, and is certainly less well-known. 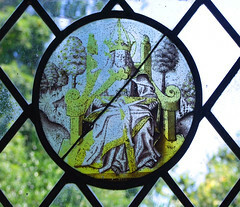 Indeed, some people would be surprised to learn that it has more figure brasses than any other church in Suffolk, not to mention much else of interest. But first, you must get there. Sotterley is easily found on an Ordnance Survey map because it looks so darned curious. The roads between Beccles and Southwold swerve widely to avoid it, and it is marked as a large, round private park, about three miles in circumference. Houses scattered around the perimeter form the village, but the parkland itself is all open fields, lawns and a long ornamental lake. 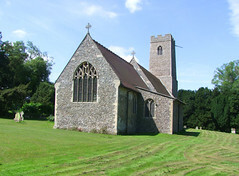 Near the centre of the parkland is the great house, and beside it the church of St Margaret. However, when you get here you'll find that it is only a private driveway which reaches the house from near the turn off to Willingham, and it doesn't give access to the church except for services, and no public footpath crosses the park. In addition, you cannot see the church from any public road, so unless you have the map or inside information, you won't even know it is there. Just to the north of the private drive entrance, there is a gap in the hedgerow and a wooden stile. This is the start of a walk which is almost a mile long; it will take you across the fields and to the church. As I said before, it is not a public footpath; rather, it is an access path across what remains private property. So you climb the stile, and set off across the fields. In summer and autumn you will find yourself walking through cows, but they are harmless enough. The way is marked by large OS church symbols on white boards attached to trees, but they can get hidden by growth in springtime. After about a third of a mile, the path diverges rightwards down to a rickety wooden bridge across the infant River Blyth, and then into the field beyond. 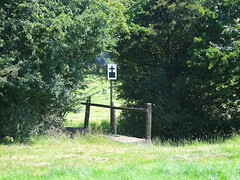 The path then skirts the righthand edge of a field for about a third of a mile (don't be tempted by the signs to hop the fence; you'll only need to come back into the field to cross the next river) and takes you round to another wooden bridge with sheep gates. Here, you can see the church for the first time. Across the next field, you enter the churchyard in its north-west corner. St Margaret is a long, low building, with a tower that is at once simple and elegant. The lower stage is probably Norman, and the great rebuilding here happened unusually early for Suffolk, certainly before the Black Death. 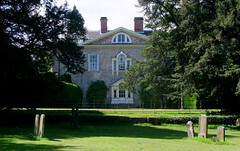 The 18th century Hall sits immediately to the south, separated from the graveyard only by a low wall. 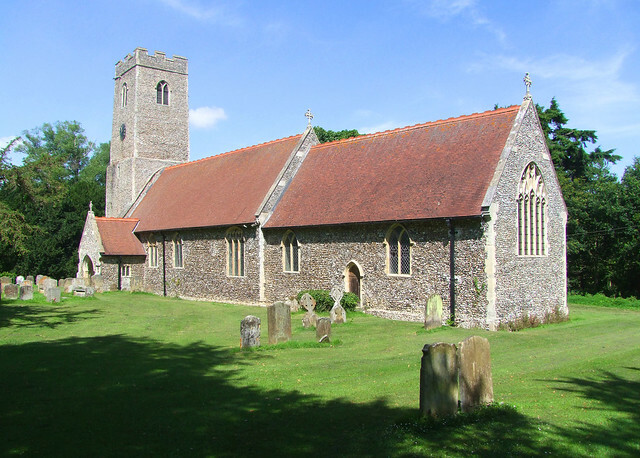 St Margaret is a classic example of an estate church, one of few in Suffolk that retains its relationship with the Big House. The estate was the home of the Playters family until the middle of the 18th century, and it is their name you'll find all over the inside of the church. Earlier, it had been the seat of the Soterleys, and later it became the home of the Barne family, who we have already met at Dunwich. The families have been good guardians, because the building not only retains eight figure brasses and numerous other inscriptions, but some fascinating medieval glass, wonderful roof corbels, a good roodscreen (albeit completely repainted) and Suffolk's loveliest monument. All in all, it is a shame that Simon Jenkins missed it. So, pausing to note the unusually early 1678 tomb to Rector James Bell to the south of the chancel, you step through the little porch into the cool of the church. 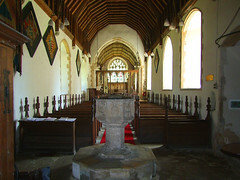 Although much of the fabric of the building is original, there was a substantial late 19th century restoration here, which filled the nave with middle-brow furnishings. 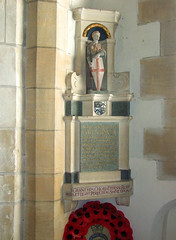 The font is a good example of the typical 15th century East Anglian design, and there are four hatchments above the war memorial. 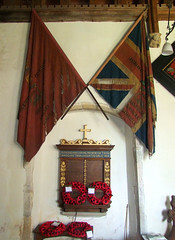 This end of the church is no more dramatic than many other local churches, but don't miss the banner stave locker set in the wall to the west of the south door. 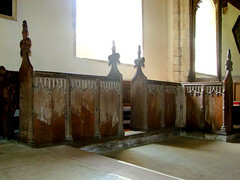 These tall alcoves were supposedly designed for holding processional crosses and the like; there are about a dozen of them, but they are only found in the churches of the north-east of the county. What did people do elsewhere? As you walk east, the building becomes more interesting, and once you are in the chancel it is fascinating. 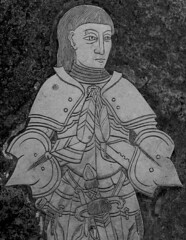 Here, the Soterleys and the Playters remembered themselves in brass and stone. 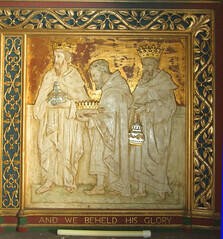 Some of the brasses are set in the sanctuary, others in the centre of the chancel floor. There are six figure brasses in total. 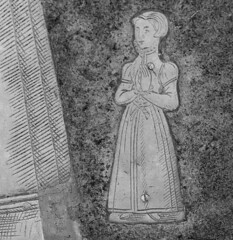 All the brasses except that on the tomb chest are covered by removable matting, but it would be easy to miss them if you did not know that they were there and did not think to investigate. 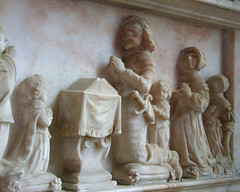 The same cannot be said for the grand 17th century monument to Sir Thomas Playters to the north of the sanctuary. It is probably the most famous in Suffolk, and I think it is the best. It was actually installed during the Commonwealth in 1658, and Mortlock says that the sculptor was Edward Marshall, who would become sculptor to the crown at the Restoration of Charles II in 1660. 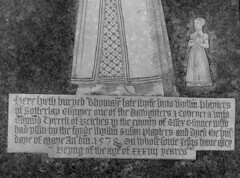 Thomas Playters had died in 1638, and a brass inscription in the chancel floor remembers him. 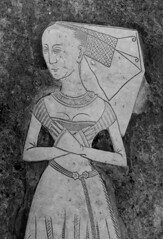 Here on the wall he is shown in the middle, with his two wives on either side, both conveniently called Anne. 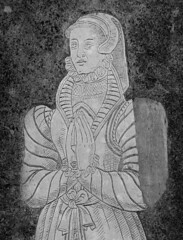 By Anne I he had two sons and two daughters, but Anne II bore him a jaw-dropping eighteen children. 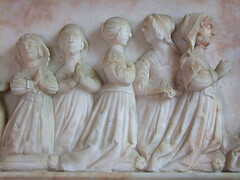 What makes the memorial so remarkable, though, is the way the 22 children are shown as weepers on the panel beneath. 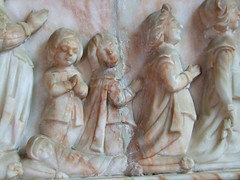 Instead of the usual uniform kneeling figures united in sorrow, each child is given its individual character - in short, they all look like different people, and are doing different things. 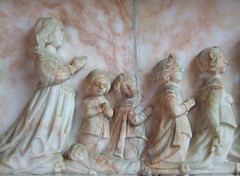 Some kneel in formal prayer, but others are distracted; one turns round to chat to her sister, while others gaze out at the viewer. One poor little mite is wrapped in a blanket right near the middle of the panorama. Some sources describe this as a 'chrysom cloth', but of course this cannot be right, because in the middle of the 17th century such a Catholic sentiment would be quite beyond the pale. It has to be said that Sir Thomas's first family look more equal to the task of formal mourning than the second. 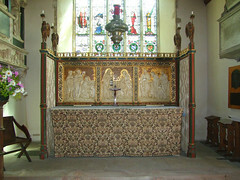 The monument is rather hard to photograph, because the altar screen stands in front of part of it. 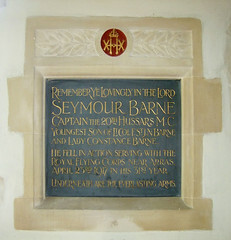 Another fine Playters memorial is on the opposite side of the sanctuary; part of the inscription is in Greek, which always looks unfamiliar in an English church. Stepping back through the screen, the nave is lighter than the chancel because of the two large windows either side. Presumably, they were intended to light the rood, but the one to the north is set in the closed entrance to a now-vanished transept chapel. 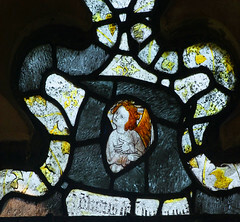 Panels of medieval and continental glass have been set in them, surrounded by clear lozenges. 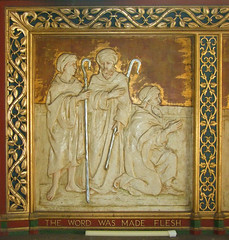 Among them are a Lamb of God, Christ in Majesty, a pilgrim who may be St James, and a later Flemish Holy Trinity; God the Father sits on a throne with the crucified Christ on his lap, while a dove perches on his shoulder. 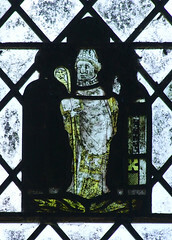 There is some other good glass in the west window beneath the tower; a king with a sword walks towards a beckoning bishop, rather as if they were on their way to a chess match. I wondered if the person who set them there had imagined them to be St Paul and St Peter. 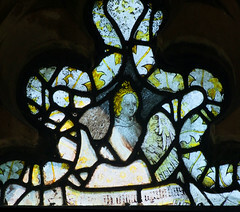 Perhaps the best medieval glass in the church is behind the altar screen in the east window, so you may have missed it. 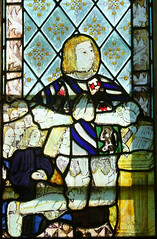 Beneath the restrained Victorian saints is a reset 1470s portrait of Sir William Playters, with his sons grouped behind him, looking as if he is on holiday from the north aisle at Long Melford. 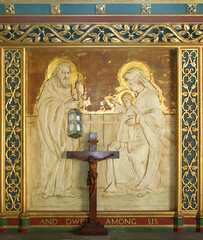 The gorgeous reredos beneath it is by Sir Charles Nicholson, and is redolent of the Anglican piety of the first quarter of the 20th Century. The screen, then. It is elegant and pretty in that way that only smaller screens are, but it has been heavily restored and repainted. This incurs the wrath of the likes of Cautley, but we have no way of knowing what was lost and in an case it is done here rather well. The original doors are in place, which is very unusual in this part of the county, and the cusping at the top was thought original by Mortlock. 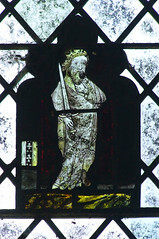 The Saints are in an early 20th century style, and are mostly easily identifiable from their symbols. 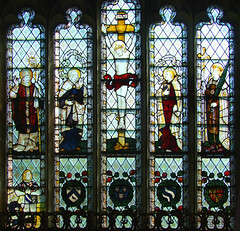 I thought the best were St Batholomew, St James, and St John the Evangelist. You may notice as you wander about this building the wooden memorial crosses to the two Barne sons who were killed in the first world war. These poignant, amateur memorials marked the graves of troops killed in France, and were later sent home. 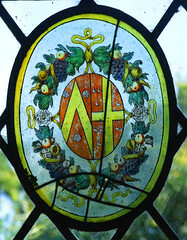 In the 1920s there were hundreds of them, thousands, scattered through the parish churches of England. 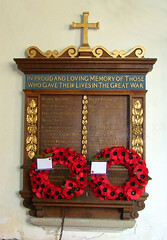 Gradually, they were replaced by more permanent memorials, and many were removed by families or destroyed. A few survive, here and there - there are six at Leavenheath and seven at Melton. 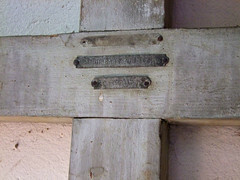 In fact, there are fine memorials above the crosses, and the boys' names are also on the parish memorial on the north wall. But the crosses have survived. And so has something else even more poignant. This is the original roll of honour, now on the wall behind glass under the tower, on which the names of the local dead were written as the awful news came in. It is horrifying to see so many young people's names in such a tiny parish as this; there are fifteen of them, including four in just twenty days in September 1918. At Hitcham a few days earlier I had learned how, of the 42 men of that parish who never returned from the mud and blood of Flanders, only 28 had made it on to the war memorial. A contemporary record, like the roll of honour here, probably gives a truer picture of the way the carnage devastated rural communities, and changed England forever. I stepped outside and breathed the spring air, looking across at the grand facade of Sotterley Hall. In the early 19th century the residents of the Hall wearied of seeing the funeral processions of the poor passing their drawing room windows, and provided a new burial ground down at the crossroads in the village. This included a pretty red-brick mortuary chapel, which survives today.